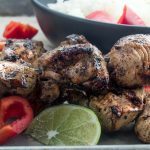 This grilled Moroccan Chicken recipe is a healthy option for grilled chicken, comfort food spices flavor the tender chicken for easy, healthy entertaining. 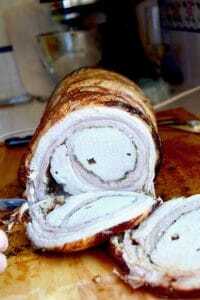 Im always looking for flavorful foods that are somewhat healthy to be able to serve for company. 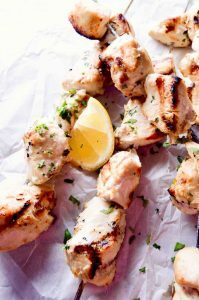 These Grilled Moroccan Chicken Kebobs work beautifully and the fact that they are super easy to make and I can pretty much prepare them ahead of time up until the grilling makes them a natural choice for entertaining. When you see a Moroccan Chicken recipe what will you normally get? Moroccan chicken is usually made in a stockpot by braising whole pieces of chicken for a long time with moroccan spices. It can have the addition of fruits such as apricots, almonds and vegetables such as carrots, red peppers and zucchini in the braise. The spices that are common to many Moroccan chicken recipes are cinnamon, paprika, turmeric, cumin and coriander. Be sure and cut the chicken into equal sizes. This will allow for even cooking. If you have some pieces that are small and some large, the smaller ones will be dry and possibly burnt by the time the larger ones are cooked. When you are placing the chicken onto the kebabs/skewers place them on gently and don’t pack them too tightly. A little space is ok (even better) but if they touch don’t pack them super close. This is so the chicken can be touched by the heat. If you pack them too tightly, its harder for the chicken to cook evenly. I prefer metal skewers like these here on Amazon because I don’t like to take the time to soak wood ones so they don’t burn. But any skewer you have will work. Do you like grilled food? 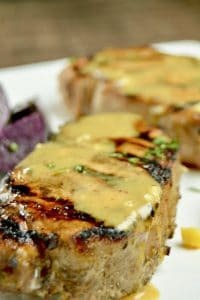 Check out these recipes for other grilled meat options Grilled Coconut Lime Skewers, Grilled Honey Mustard Pork, Porchetta and my personal Favorite (and most popular grilled meat on my site. Grilled Steak with Bourbon Butter! If you are looking for easy grilled recipes be sure and sign up for the mailing list here where you see “Join the West Via Midwest Community” Or pin this recipe to your grilling board so you have it when you are looking for things to grill! 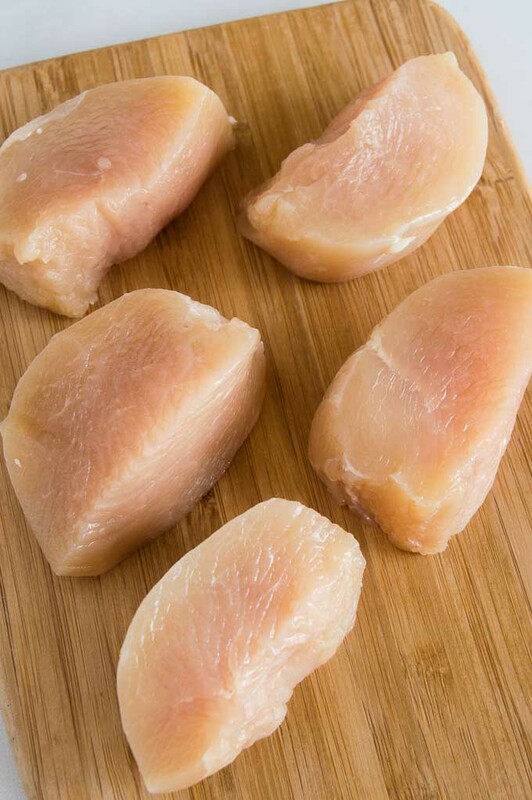 Cut chicken in to 2" cubes, making sure to cut them all equal in size so they cook evenly. Set aside. Into a small bowl, combine all other ingredients and stir to mix well. Into a large ziplock bag, pour bowl of spice/oil mixture. Then place chicken cubes into the bag. Press all air from bag, then seal the bag. Move the seasoning all around once the bag is sealed so that all chicken is covered with the marinade. 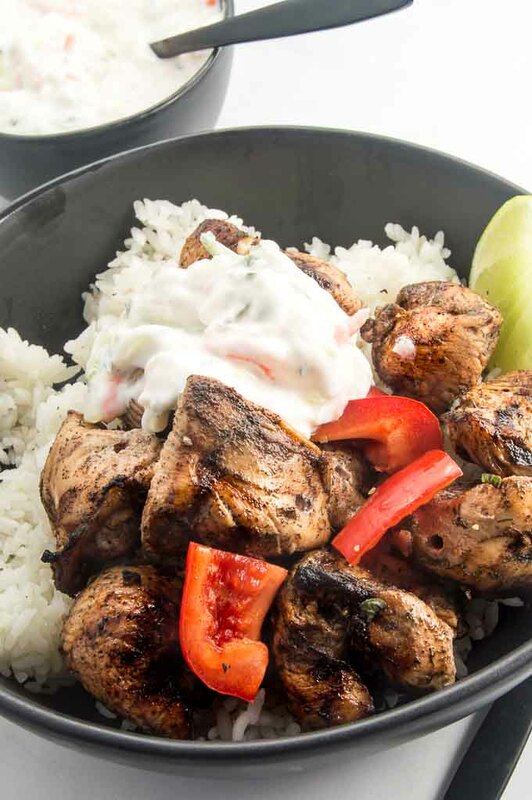 While grill is heating up, place chicken cubes onto skewers/kabob sticks. Do not over fill the kebob, you want there to be as much chicken area to be able to be exposed to the flame. The chicken can touch, but don't press it super tightly. Place the skewers on the hot grill, leaving 2 inches in between the skewers. Watch for hotspot and keep the chicken from flame ups. Every grill heats to different temperature, but I grilled the kebobs for 7 minutes on one side, then 5 on the other. I always cut into a couple of pieces to make sure chicken is fully cooked and that there is no pink remaining. 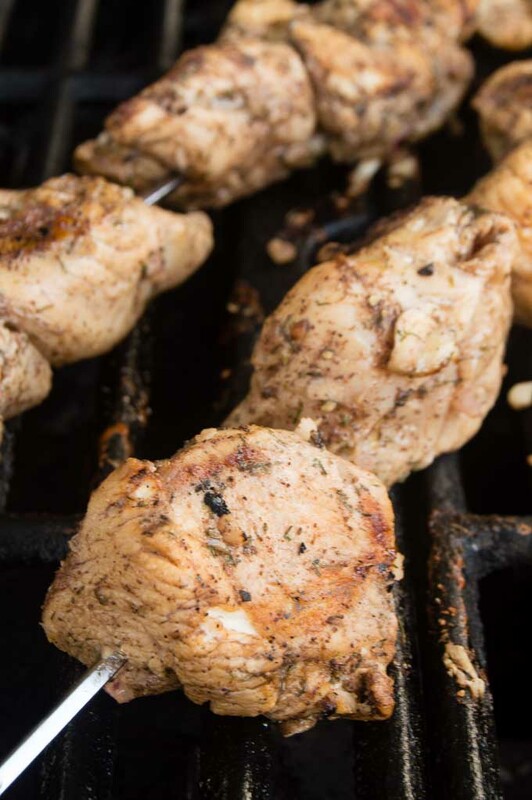 If you want to avoid wasting chicken, put any smaller pieces on one skewer and put them on the grill after the others have cooked for a while. Also, you can fold longer chicken pieces as you put the them on the skewer and put them closer together instead of leaving space between the pieces. This sounds like such an incredible meal! I need to try making it! Seriously amazing flavors!! Thanks for all of the grilling tips!! Delicious flavors and such a great tip to cut the chicken the same size! It does make a difference when some are cooked too quickly. I love all of the spices you’ve used here and the tips for making kabobs, it’s time to fire up the girl!! That chicken looks so flavorful. I just love the spice combo you used. Cooking on skewers like that sure cuts the clean up tine too! 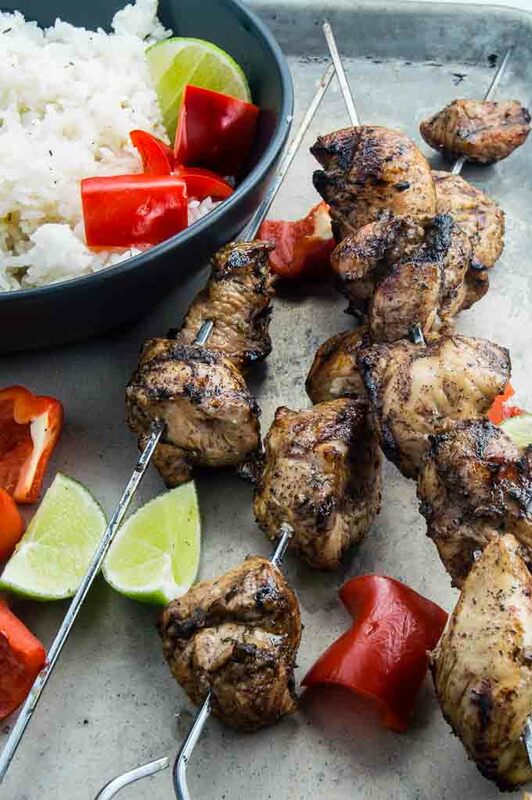 I Love moroccan flavours and skewers so these are right up my alley! Good tip for purchasing some multi-use metal skewers, it’s way easier to make skewers at the last minute with metal over soaking those wooden ones! I just love alllll the spices you have on this chicken. I love using a lot of spices since chicken is just so boring to me, and to do them on skewers is always a great idea to me. Thanks for the great recipe and inspiration with this one, yum! These look so delicious and take me back to my trip to Marrakesh earlier this year. I agree that the longer the marinade time the better. I often add the marinade and then freeze to really fill with flavour. Oh wow, Michele, these flavors are seriously some of the best there are! 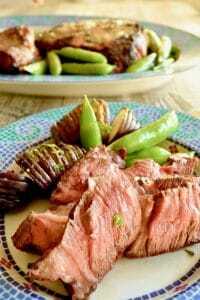 I just love grilled meat and bold flavorful marinades! We haven’t been grilling because of rain but it was 75 here today and I think that means it’s time to break out the grill again! Especially for this moroccan chicken! I love the spices in the marinade! So fragrant and they must really give the chicken such great flavor. I am itching for outdoor grilling season to circle back around in these parts, but I think I might have to pull out my stovetop grill pan and make these before then. I’ve been getting so bored with my usual weeknight chicken routine! Moroccan spice blends are the best! I need to try this with the kabobs, do you think chicken thigh meat would be OK? I like dark meat more than white meat. It seems to have more flavor and juicy. How much oil do you add for the marinade? I love how simple this is! And, I love all your tips! I also use metal skewers, so much easier than wood and they don’t burn! Wow what GREAT insights on what Moroccan chicken recipes mean! I’ve never seen it laid out like this and I LOVE it! And thanks for the link for the skewers, I needed some new ones. This recipe is definitely getting pinned to my MUST MAKE board! These are too easy to make to taste this good. You’re the best neighbor letting us have he left overs! We loved this so much!